Celtic have just come off one of the most successful seasons in the club’s history. Not only did the Hoops achieve a domestic treble, they did so without losing a single game. That’s certainly the first achievement of its kind in British football. Be that as it may, good teams never stop looking for ways to improve. This article will identify areas in which Celtic could strengthen, highlight possible future concerns, and recommend signings to solve these issues. For the past 18 months, fans of the Parkhead club have been treated to the talents of winger Patrick Roberts on loan from Manchester City. The 20 year old took to the Scottish league like a duck to water, finishing the 2016/17 season having been directly involved in 30 goals and assists. He also won 28 fouls in the final third over the year; valuable to a side so adept at set pieces. The trouble for Celtic is that Roberts has now returned to Manchester City. This means that Celtic have a 30 goal gap in their team heading into next year. With 6 dribbles per game, Roberts ran with the ball more than any other player to have completed over 1000 minutes in the Scottish Premiership. Of his 19 assists, 12 came directly following a dribble. His skill with the ball at feet is one of Roberts’ strongest points. Adama Diakhaby is a 20 year old attacker playing for Stade Rennais in France. 2016/17 was somewhat of a breakthrough for the youngster as he played 20 games and scored 4 goals. He also took on his opponents 5 times a game (3rd highest in France), with good close control and a blistering turn of pace. This is a guy with a huge amount of potential. Celtic can probably sign him for £2-3 million if they’re quick. The chance of trophies, European football and working under a top class manager would probably tempt Diakhaby away from mid-table Ligue 1. Mould him well, and Celtic could be looking for an eight figure fee further down the line. 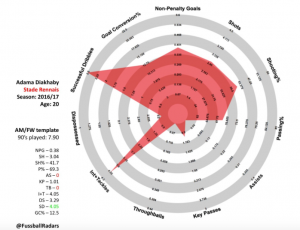 While Diakhaby appears to be more of a selfish player that Roberts, the above radar (courtesy of @FussballRadars) shows that this is a player who is more than capable in an attacking sense. That’s in one of Europe’s top leagues, and at the age of just 20. Another possible target comes from the under 20 World Cup- a competition Celtic are known to have been scouting. Xadas is a 19 year old Portuguese midfielder yet to make his way into the senior Braga side. However, he has impressed in the B team with eleven goals and seven assists last term. Furthermore, he is just coming off an excellent under 20 World Cup, where he inspired Portugal to the quarter finals. Unlike Roberts, Xadas isn’t an out and out winger, usually playing through the middle. That being said, he has the attributes of a star in the making. Dribbling, passing and first touch are all excellent. His anticipation means that he often wins the ball back in the final third, making life difficult for the opposition. However, as this clip shows, he can be difficult from even deeper. With these two players, there is both high risk and high reward. For both, a move to Glasgow would be entirely outside their comfort zone, while each would require a significant outlay. On the other hand, both of these players have everything in their locker to be successful international footballers. If Rodgers manages either player correctly, Celtic would not noticed Roberts’ absence at all. Strength in depth is important for a squad that looks to complete in both domestic and European competition. For pretty much every position on the pitch, Celtic can call upon two international quality players. Everywhere but in goals. At 34 years old, Craig Gordon still has a few years left in the tank. It is testament to his commanding performances that Chelsea had two bids rejected for his services in the January transfer window. When the English champions come to Scotland for a player, you must be doing something right. Nevertheless, the position of goalkeeper is probably the one which Celtic must urgently address this transfer window. As steady as Gordon has been, his career has sadly been plagued by long term injuries. On the bench, neither Dorus De Vries nor Logan Bailly have looked particularly convincing. The former was dropped after 5 games, while the latter was offered to relegated Championship side Raith Rovers in January. With this in mind, Celtic should be looking for a goalkeeper to compete with Gordon. It is not enough to sign somebody who may one day be a suitable replacement; a team looking to compete on four fronts needs two quality players in every position. Robin Olsen of Copenhagen could be interesting. At 27 years of age, the Swedish first choice goalkeeper has enjoyed a stellar season in Denmark, keeping a clean sheet in 19 of his 33 matches. At 1.98m, he’s perfect for collecting high balls into the box. However, he also has excellent reflexes, as can be seen below. Like Celtic, Copenhagen dominate most of their domestic games, with an average possession share of 59%. Olsen speaks fluent English, comes from a similar standard of league, and plays at a club who play a broadly similar style of play as Celtic. He could be successful at Parkhead. Of course, if that should fail, there’s always Victor Valdes. While the Barcelona legend is the same age as Gordon, Valdes would be an excellent addition to the dressing room and would provide a clear, immediate upgrade on the existing backup. As successful as Celtic have been in Scotland, their aptitude in Europe remains a grey area. While Celtic were handed a tough Champions League group in 2016/17, they never looked particularly comfortable in their qualifying rounds. In fairness, these games were at the beginning of the Rodgers regime. Twelve months on, and the squad will be far clearer about what their manager demands from them. However, there is a specific move that Celtic could make that would instantly give them a better chance against continental opposition. Tiago would excel for Celtic in this arena. The Portuguese veteran has just left Atletico Madrid, where he took the Spanish giants through one of the most successful spells of their history. While youth may not be on his side anymore, Tiago only gave the ball away once every 80 minutes last season- a pretty decent statistic considering those games with in La Liga and the Champions League. The Portuguese would be an assured presence in the centre for Celtic against possession heavy teams like Barcelona and Manchester City. However, his presence would also free up Scott Brown to drive forward in games Celtic are expected to dominate. If Celtic did absolutely nothing this summer, they would still be strong favourites to repeat their domestic dominance of this campaign. It is generally a well-balanced squad, short in neither depth nor quality. However, that should be no excuse to tread water. Patrick Roberts was a significant player for the Scottish champions, while an injury to Gordon could leave them exposed at the back. Some well-planned recruitment this summer would not only alleviate these worries, but allow Celtic to further strengthen their reputation as an excellent place to develop as a footballer. It might even win them some more trophies along the way.